My blog got a makeover! This new layout is compliments of my sweet friend Audrey over at Courage&Curls. 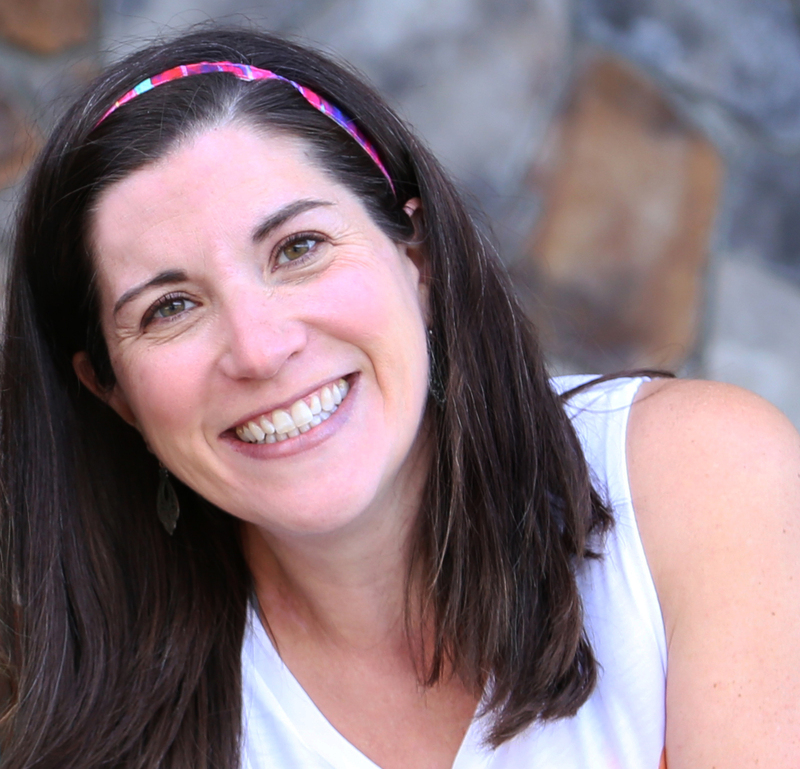 She and I share the unfortunate experience of being mamas to babies who no longer live in this world and we met in the wake of her losing her second baby. While I hate the reason life wove our stories together, I'm so glad we have found each other. Audrey's blog is always changing designs. Always fun and funky. Fresh and new. I had the blah blogger layout and was just kinda proud that I had figured out how to put a picture in the masthead. Audrey agreed to give my blog some lovin'. And here's what we ended up with! I love the colors, I love the silhouettes of my family. Audrey took a sad story, and redeemed it, giving me a balloon to hold (a.k.a., Matthew). Thanks, Audrey! Love you, girl! I adore the radio program This American Life. Have you heard it? If not, you should stop reading now, go to iTunes, and download the podcast. The show is a little hard to explain. Each week they cover a topic...sometimes it is a current news story, sometimes it is a theme, like today's show is called "The Right to Remain Silent." My dearest J hates it because he says it sounds like someone going through their grandma's attic and recording a radio show about what they find. (He is wrong, btw, but even if they did do a show titled "Grandma's Attic," I would likely find it fascinating). The reporters and storytellers explore unusual sides of an issue or ask questions that I would never think to ask, but that, deep down, I do want to know the answer to. The show is edited together with quirky, interesting music that helps propel the storyline, whatever it is. I simply don't know of anything like it in any medium. A couple weeks ago, the creator and host of TAL, Ira Glass, came to Charlotte from his home in Chicago, to talk about making the show. A few months before hand, I had tried to get some friends to get tickets with me. Nobody was able to go. So, I resigned myself to not going. 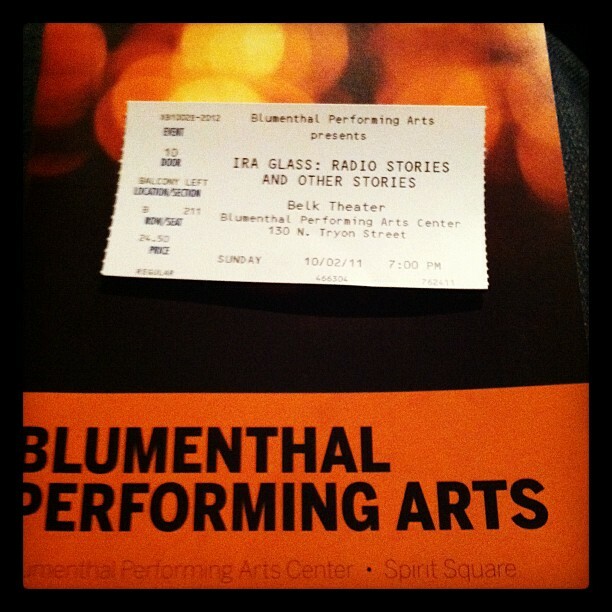 But, I woke up that Sunday morning, decided that I was a big girl and that I could take myself to see Ira Glass. I ordered myself a bargain ticket for the balcony and off I went. After a near panic attack inducing experience with parking uptown, I found my way to the theater. The theater was filled with women in their thirties, mostly brunettes with low-maintenance hair do's, dark rimmed eyeglasses, and loosely draped cardigans. "Hmm," I thought. I pushed my glasses up on the bridge of my nose, swept my long hair back behind my shoulder, and pulled my sweater around me and headed for my seat. I had no idea I fit the NPR listener stereotype quite so well! 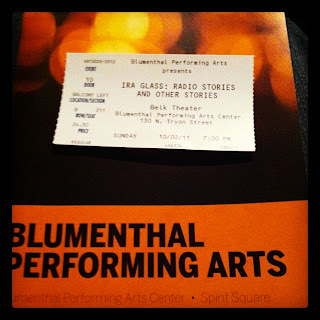 Ira Glass' has a great radio voice...unique and unforgettable. It sounds a little like Kermit the Frog meets the class nerd. Definitely an acquired taste. He started the show in the dark, just his voice. Over the course of the evening, Ira talked about the origin of the show, his philosophy of storytelling, how he edits the show, how his dream has evolved, his take on the state of journalism in America. It was like getting a glimpse of the secret recipe for a soup you love. He shared his personal experience of doing an accidental piece of investigative journalism the show covered last year. The story was compelling and horrifying and can be heard here. He ended the night talking about how you simply have to keep trying and working if you want to ever produce anything substantial as an artist. As a budding writer, the evening was inspirational...to think about how to tell a story and to hear this news: to do anything well, you have to work very hard for a very long time. It is less about talent and more about putting in the time. I thought about my desire to be a writer and a great yoga teacher. I decided I need to be more intentional with my mat and my pen & notebook. A few days later, I found this on Facebook. It has been a great reminder of my evening and helps orient me toward what I want to be as a writer and a risk taker. Thanks, Ira.